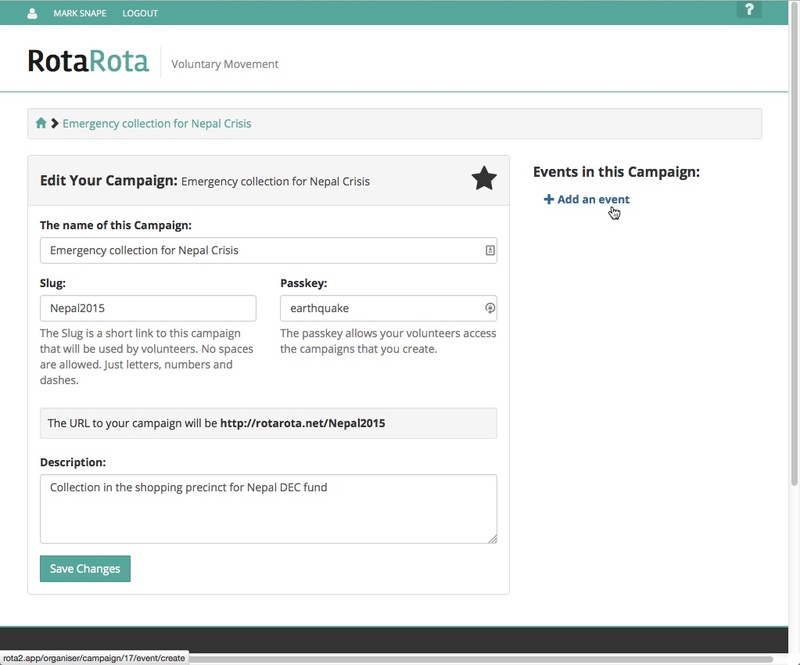 RotaRota is a site to enable organisations coordinate the efforts of their volunteers. Create campaigns, events and sessions to advise volunteers what needs to be done. 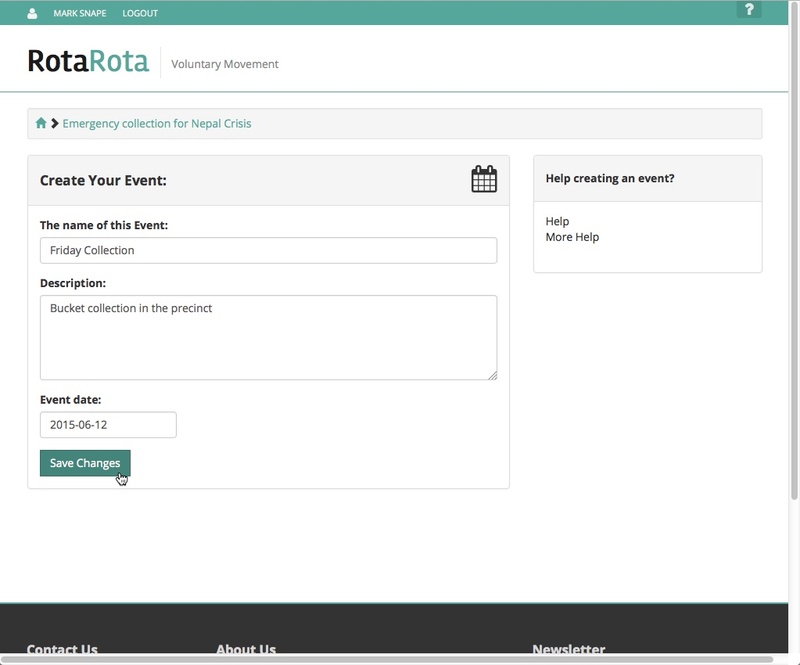 RotaRota is a free and easy to use service that allows charities, churches, youth groups, sporting clubs and other organisations to get commitment from their volunteers. Tying even the most willing volunteers down to specific dates and times can be time consuming and prone to mis-understandings and short handed-sessions. 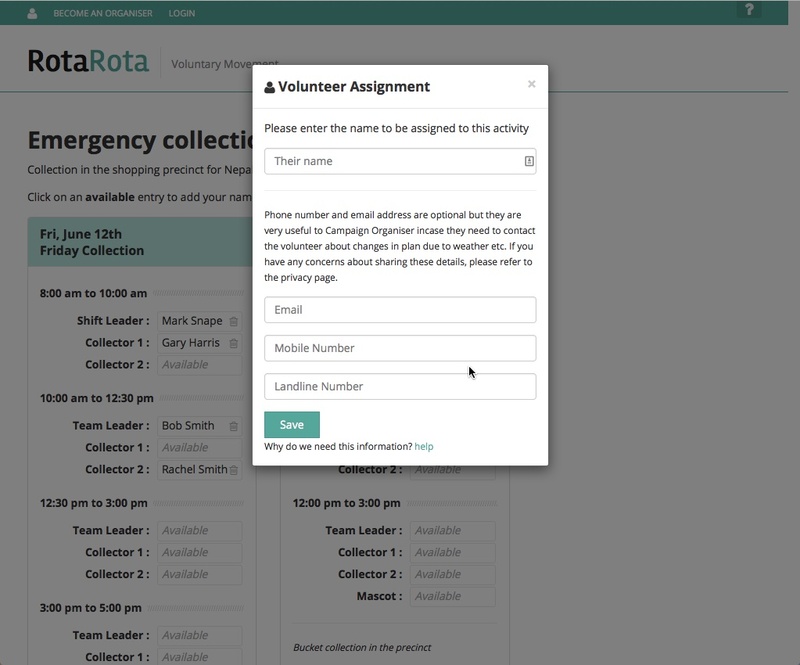 As an Organiser using RotaRota, easily create a Campaign, with Events and Activities, then share a simple link and Passkey with your community and have them self-register to take part. It takes away the endless phone calls, email circulars and double-bookings and allows people to put their name down to help when it is easy and convenient for them to do so. Send your volunteers a timely reminder when their sessions are imminent. Large campaigns are rarely run by one person, with a paid plan, give others access to the controls! Register for an account here. You can register first as a volunteer and then convert your account to be an organiser. 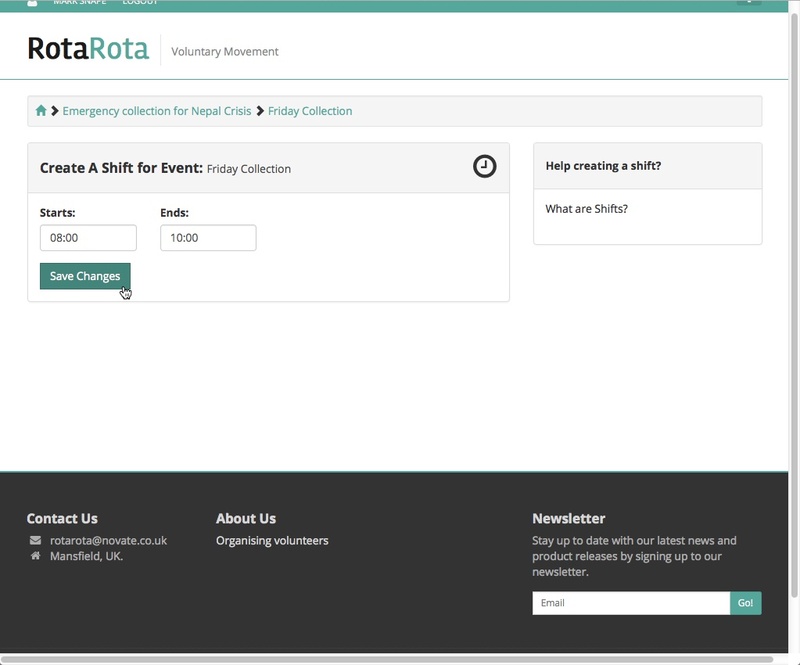 As an Organiser, how would I use RotaRota ? Simply click on the 'Become a User' button on the home page. A short form will appear. All we need at this stage is your name, email address and a password that you would like to use. You will need to agree to our terms, but these are very straight forward. You will then be directed to your user dashboard. On this screen is a panel inviting you to become an organiser. Click this button and proceed to the next step. Within a few minutes, you should recieve an email from RotaRota. If this does not appear, please check your email address is correct. Change it in your user settings if necessary and press the button to activate your organiser account again. When you have the email from us, just click on the link provided. This will verify that we have the correct address for you. Your Organiser account is now active. A Campaign is a collection of events that will happen at a similar time, or are similar in nature. For instance, for a fundraiser, a Campaign could be a sequence of events for which you need volunteers such as a weekend collection at a supermarket. 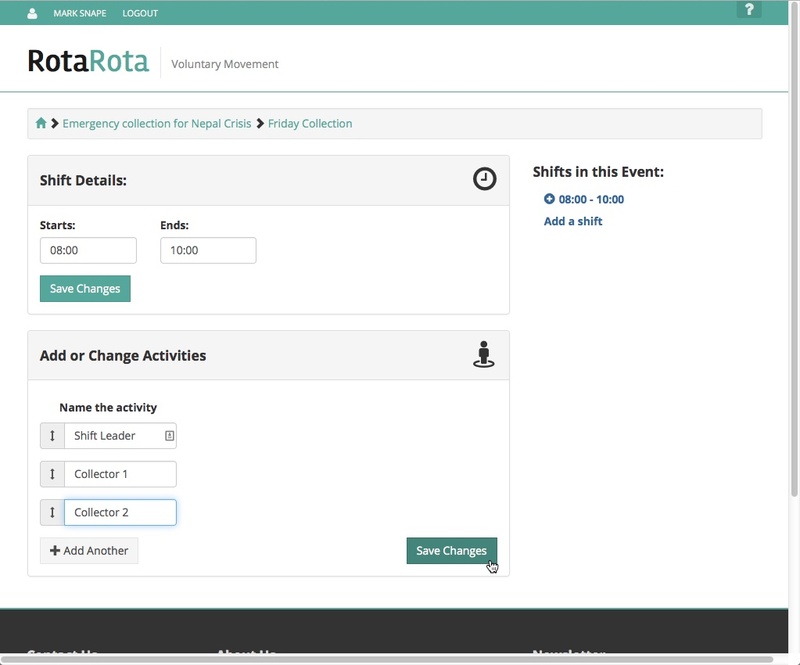 You share the details of the Campaign with your Volunteers, and when they access the RotaRota they see all the events they can sign up for in one screen. To create your first campaign, simply click 'Add a new campaign'. Fill in a few details such as the 'slug' (the link through which volunteers access your Campaign) and a passkey. An event is a group of activities on a particular calendar day. So in the example of a weekend collection at a supermarket, each day would be a seperate event. Depending on the nature of your event, and its length, its possible that you will need to break the event down into several periods of time. You may decide that a collector or volunteer should not work for more than 2 hours. Break the event down into manageable chunks. Just set a start and an end time for each shift. Activities are the actual duties that your volunteers will perform. You can create as many activites as required, each with its own name. Later, volunteers will put their names against the individual activities. Simply enter a name for the activity in the box. Add more fields if required. Flesh out the Campaign with all the Events, Shifts and Activities that you require. You can add more at any time and there is no limit. If the number of events gets unweildy, consider creating a different campaign. You can have as many Campaigns as you like, so if manning a charity shop for instance, you could create a campaign for each month. 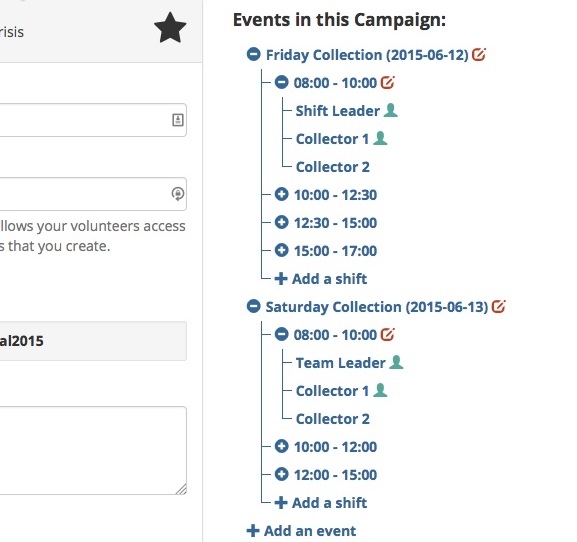 Campaigns can be linked and your volunteers easily jump from one campaign to another. Once you have the Events in place with Shifts and Activities, you can launch your Campaign. All you need to do is just pass on the link to your Campaign and the Passkey. Volunteers do not need to create an account, they can just follow the link you give them and enter their names in available Activities. 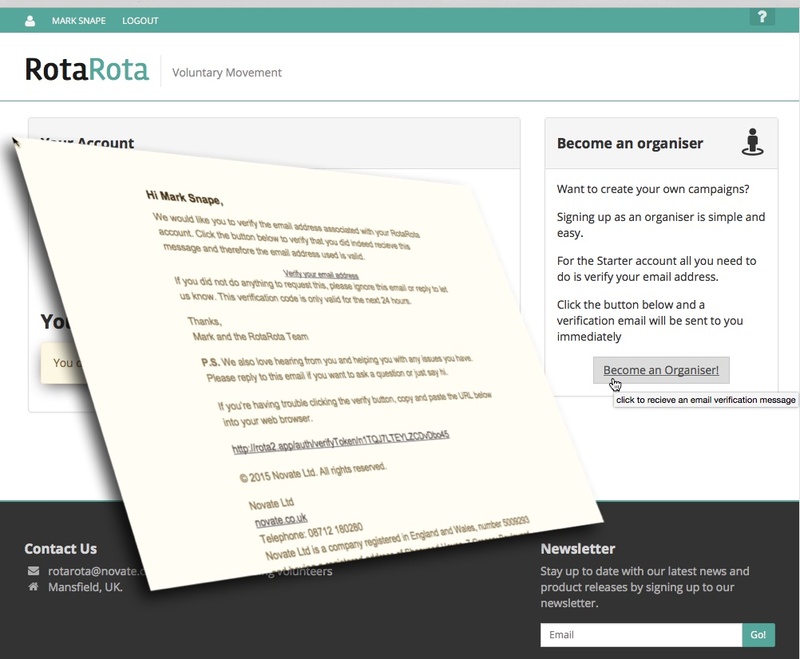 Volunteers can create an account if they want - this allows them to see a list of their personal commitments and allows the Organiser to send out messages about the events. 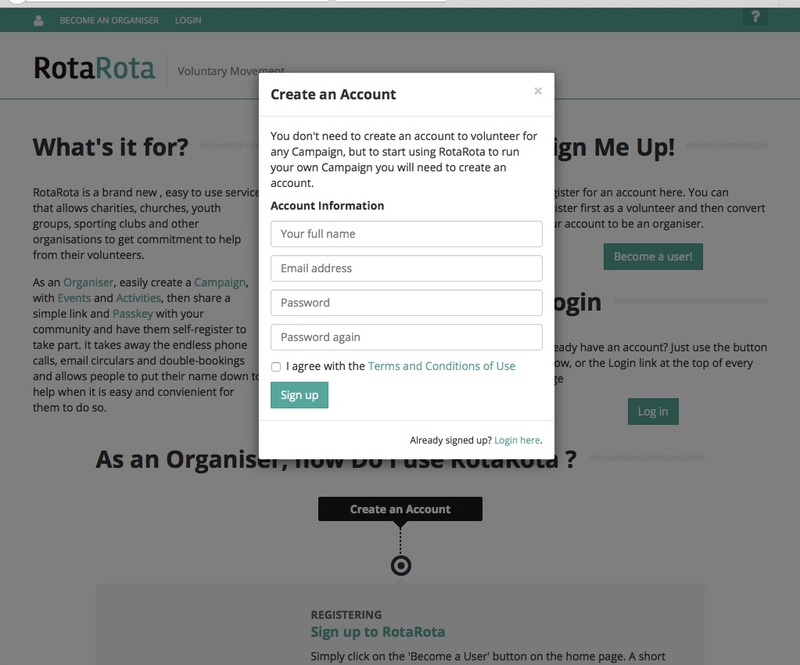 You don't need to create an account to volunteer for any Campaign, but to start using RotaRota to run your own Campaign you will need to create an account.